110 degrees and we decide to dine in Hollywood. 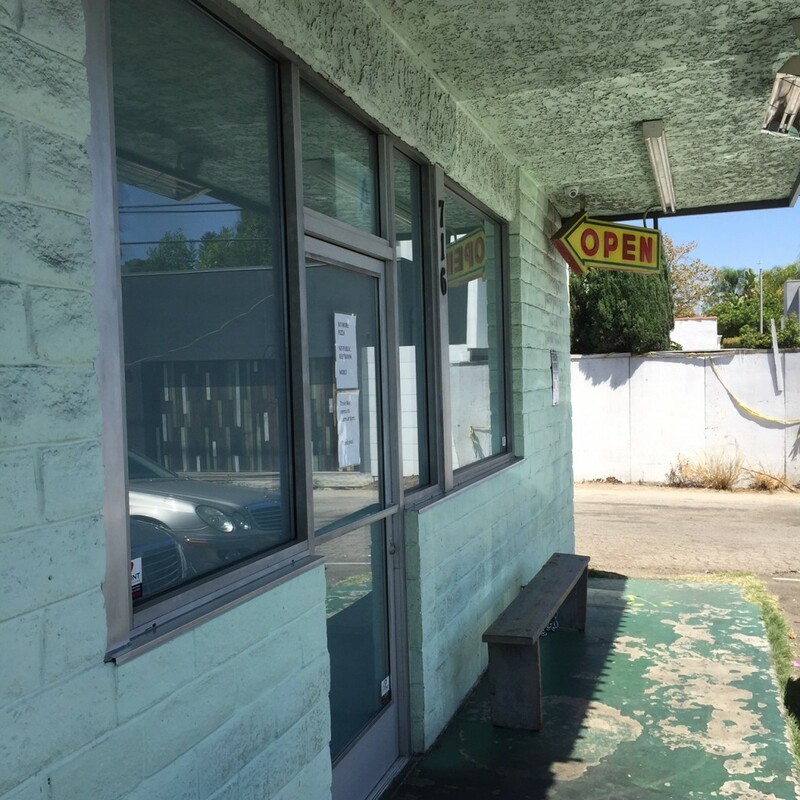 Waze directed me into a skanky looking strip mall and I thought Waze had lost its’ way, but no…crammed in between two unprepossessing storefronts stood Petit Trois. Lo and behold, there was a parking spot in front of the entrance. I quickly entered as the pavement was hot to the touch. A waiter approached and announced that there was a 30-45 minute wait at 2pm. 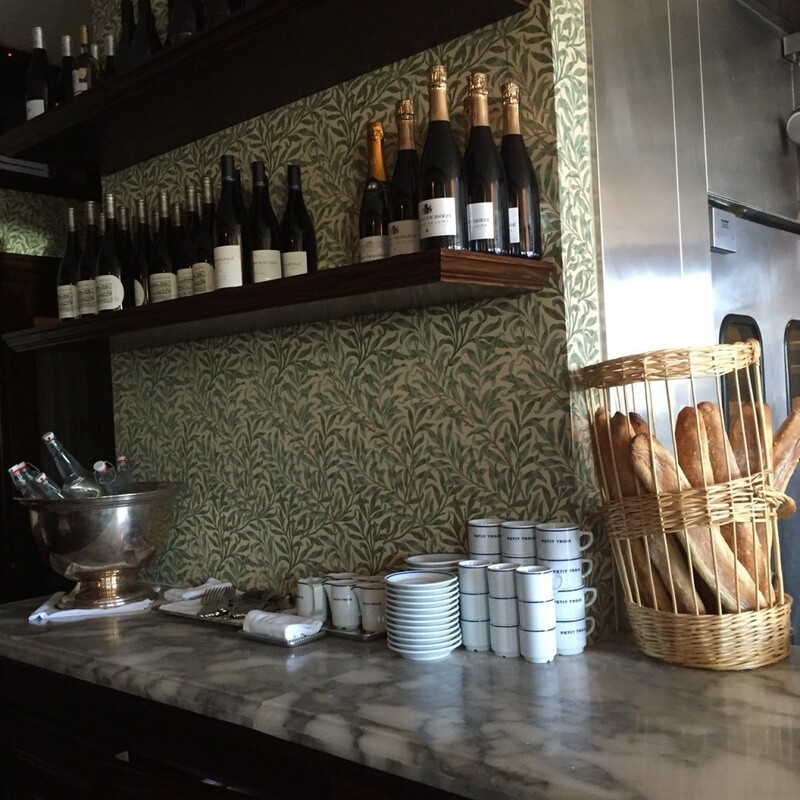 That was disappointing as Petit Trois is a tiny space and was filled to the brim mid-afternoon…hungry and no where to hang. Waiting outside was not an option. I phoned Courtny to advise her of the situation. I had read that if you arrived after 2pm Petit Trois is usually not crowded. The food Gods were looking down on us as 10 minutes later there were two stools available. Make note: the food is fabulous and if you forget what lies outside the front door, you could definitely be dining in Paris. The food is that authentic. It is cramped and the 22 stools are not comfortable. Petit Trois is shoehorned into a former mini-mall Thai restaurant next to the owners successful Trois Mec. 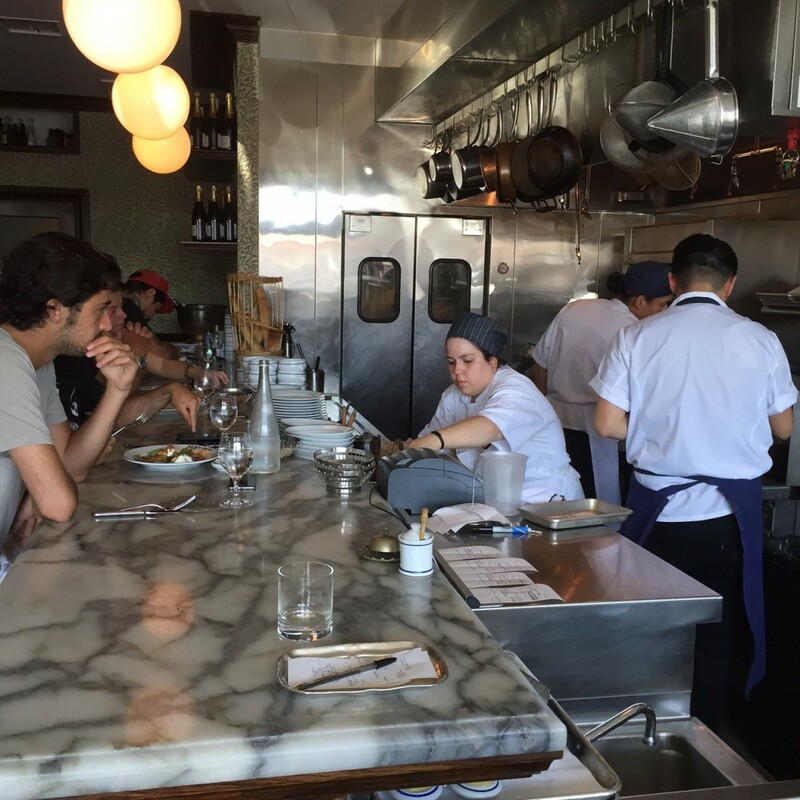 If you sit facing the wall rather than the kitchen, you have the opportunity to stare at yourself the entire meal. Unlike selfie addicts, I do not enjoy watching myself chew. I become critical of my hair, I notice new facial lines and want to touch up my make up, perhaps consider a little tweak. The food is, thankfully, a distraction. 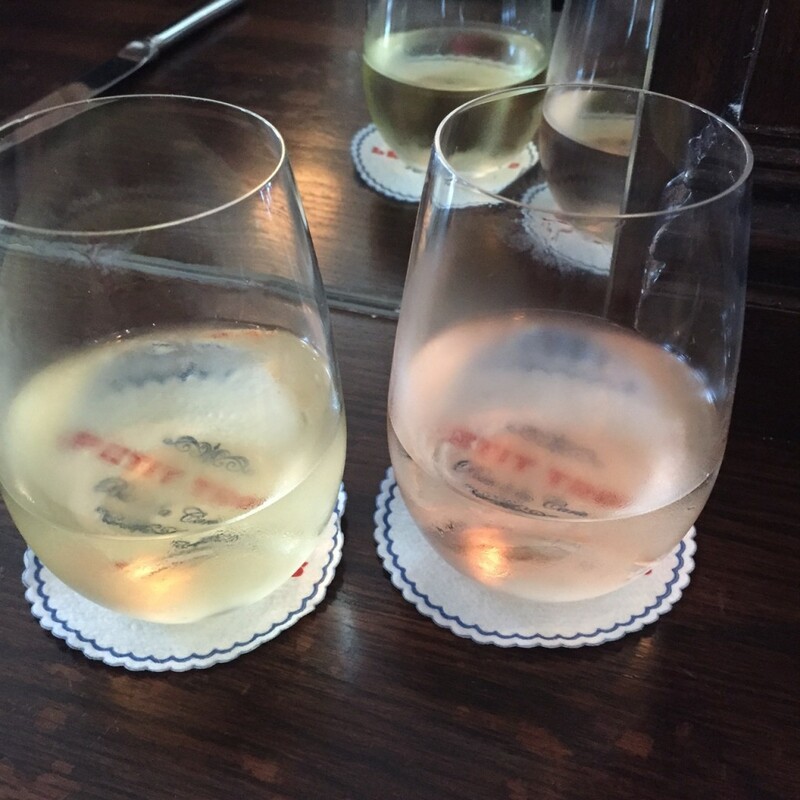 We started with a lovely 2013 Cotes de Provence Rose Domaine Sainte Lucie ($14). Courtny chose a 2013 Pouilly Fume Sauvignon Blanc Domaine del Bel Air ($13). When in France, one must order escargots and they did not disappoint. 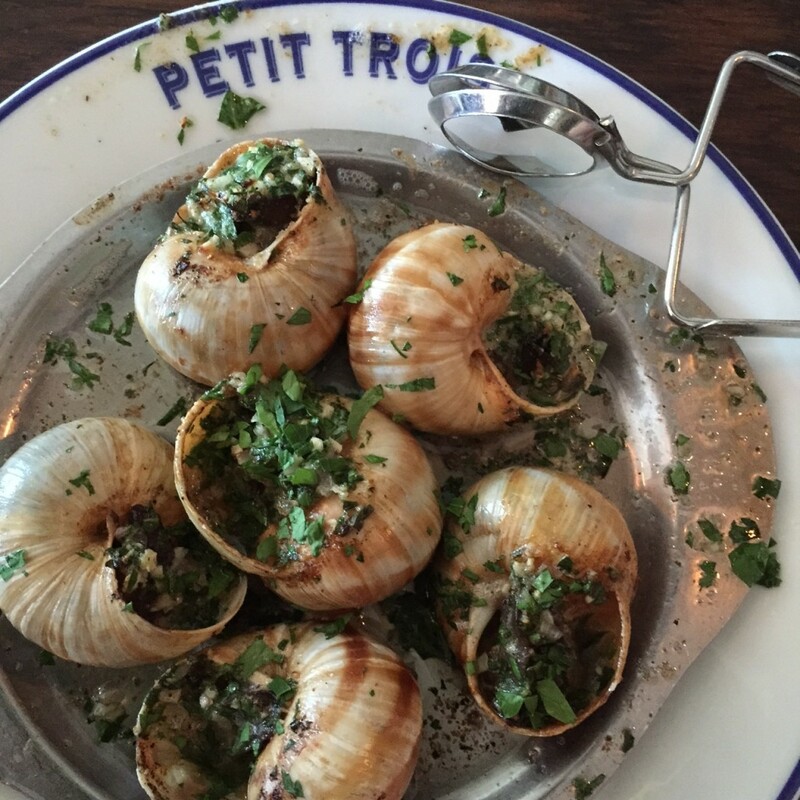 They arrived perched in divine garlic and parsley butter, accompanied by the necessary escargot tongs and snail fork. The escargots are Lefebvre’s grandmother’s recipe. I kept flashing back to Julia Robert’s first encounter with the escargot and the tongs in, Pretty Woman. The escargot were sweet, tender, juicy and the pool of melted butter was divine. The bread that accompanied the appetizer was orgasmic. It is made by Colleen of HiRise Breads and she delivers the bread fresh daily. The baguette was warm and crispy and the ratio of crust to inside dough was tremendous. I personally think bread should just consist of crust. 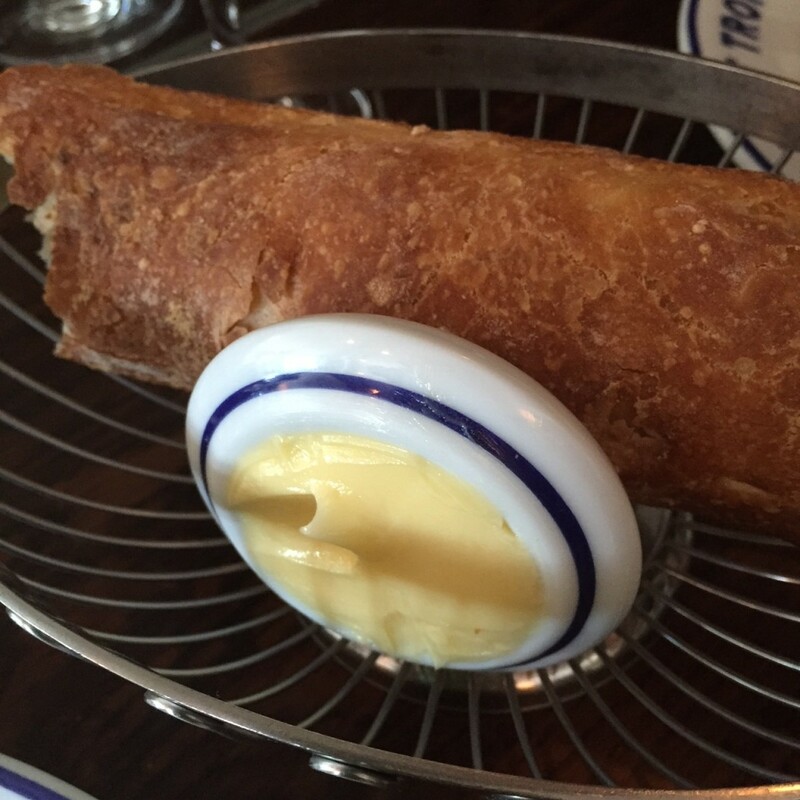 The Brittany butter was sweet and very creamy. I could just order that as a side. We decimated the snails and mopped up the sauce and were onto the next course of Melon & Ham with burrata and buckwheat honey ($15). 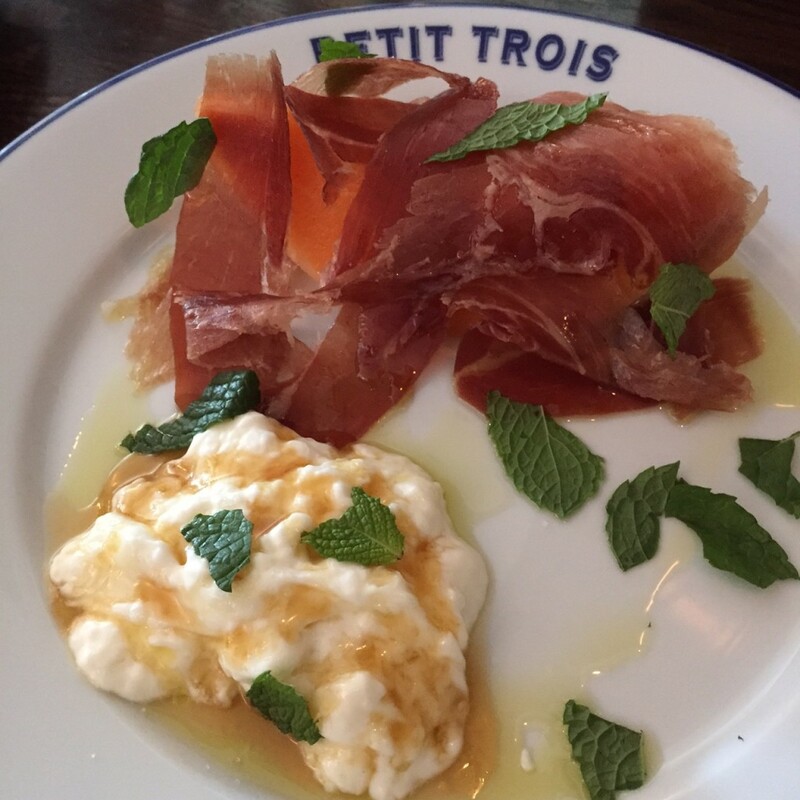 The burrata, sweet orange melon and mild, perfectly cured ham was outrageous. I am not a huge ham fan, but this was perfection along with the melon and burrata. The other tempting appetizers included heirloom tomato salad with buffalo mozzarella ($15), french onion soup which was not in consideration due to the extreme heat ($13), steak tartare with fried shallot and elderberries ($19) and a cheese plate ($12). The entrees proved to be more of a dilemma. The Brittany Wild Sole Meuniere sounded divine, but at $79 I passed. The Confit Fried Chicken Leg with frisee salad was not an option ($24), the Boursin Cheese Omelette looked good and is apparently a Justin Timberlake favorite, but we were not in an egg mood ($18). Croque Monsieur/Madame ($18/23) were an option, but we had already met our carb quota. The Bouillabaisse ($29) was not available so we chose between the Big Mec double cheeseburger ($17.95) and the Ribeye Steak Aux Poivres with frites maison ($33). 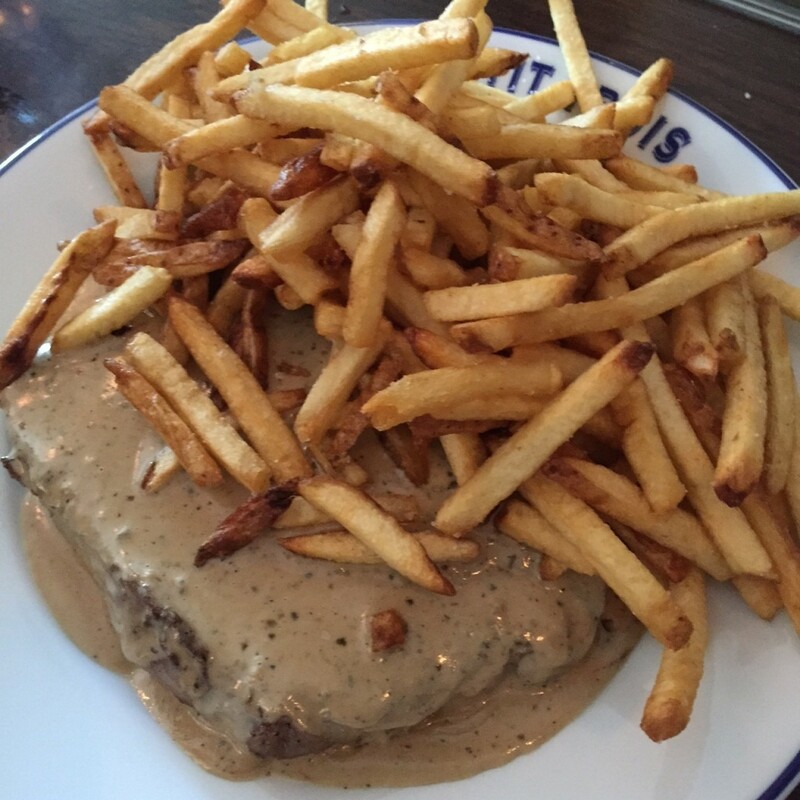 We chose the steak and it was wonderful, the sauce divine and peppery and the pommes frites just so french. It was a heavy entree for the day so we shared and still left quite a bit, but it was undeniably delectable. We passed on dessert which consisted of Paris-Brest ($11), Chocolate Mousse ($9) and a Napoleon ($10). 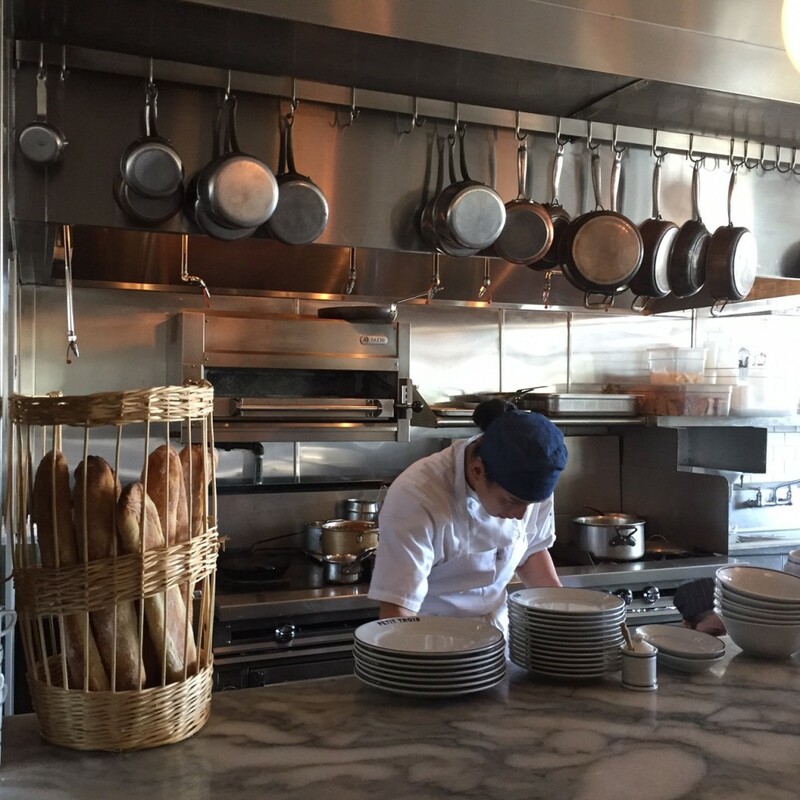 Petit Trois is owned and operated by the Trois Mec team of Ludo Lefebvre, Jon Shook and Vinny Dotolo. Petit Trois is the second collaboration between Lefebvre and Animal, Son of A Gun and Jon & Vinny’s dynamic duo comprised of Dotolo and Shook. Petit Trois reminds me of a neighborhood french bistro. It is small, charming and the food exceptional. The wait staff is friendly and knowledgeable. 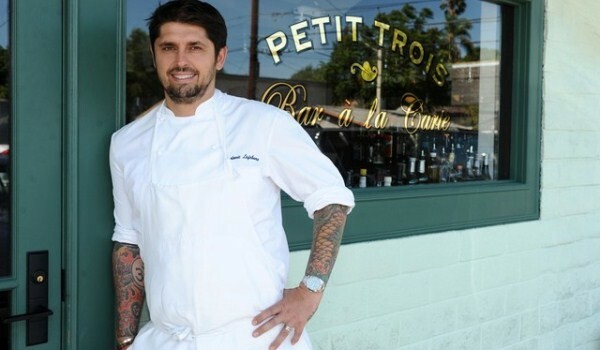 Petit Trois is definitely worth the trip to Hollywood, especially if you are a devotee of classic french cuisine. 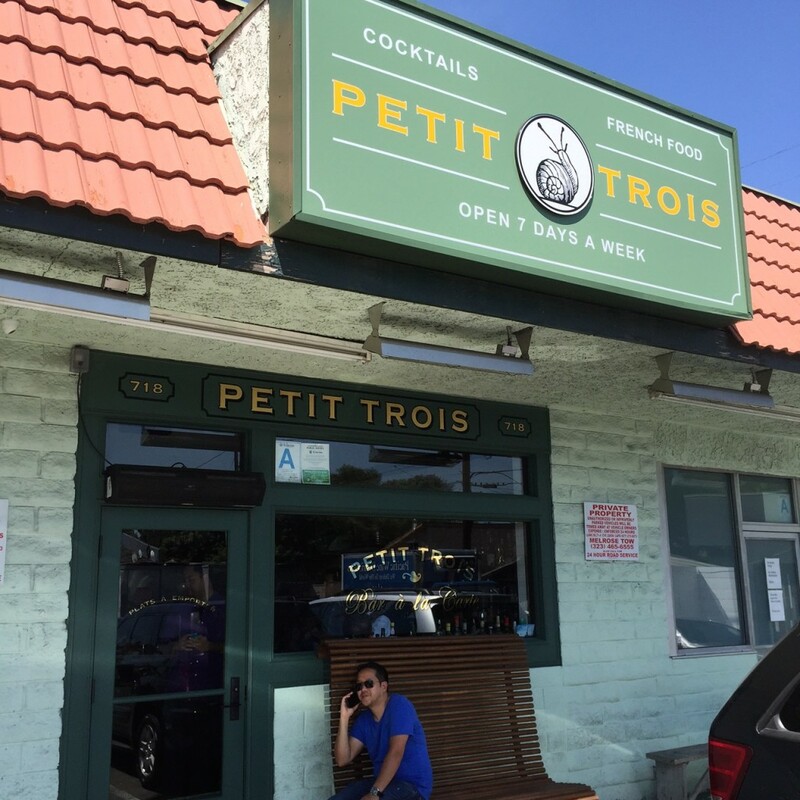 Petit Trois 718 North Highland Avenue, Los Angeles, California. Open 7 days for lunch and dinner, Noon-11pm. No reservations. Street parking. An 18% service charge is added to the bill. No cash. Credit Cards only.